Without a shadow of bias the landscape around the field of Flodden is one of beauty and of variety. This diversity of landscape and the underlying geology that underpins it is also woven through the fabric of the battle of Flodden, and not just the boggy ground that played a pivotal role in disrupting the Scot’s pike formations. 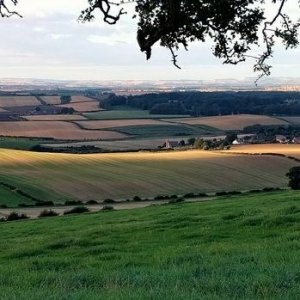 The choices made by King James IV about where he wanted to place his stronghold, on Flodden Ridge, and where he was tempted to reposition, on Branxton Ridge, were directed towards landforms that gave the advantage of height and slope, for observing, ordnance and troop deployment. The route to the battlefield is also littered with landscape reference. The castles sacked by King James on his way to Flodden were placed for their defensible locations, the search for fording points on the River Till, working out a valley route behind hills to make the English flanking manoeuvre invisible to the Scots, and the view from Watchlaw Hill across the Milfield Plain, all reference key landscape elements. The hard rocks immediately beneath Flodden Field can be described in a tale told in three acts. This story also has a prologue in deeper time and a crucial and geologically unconsolidated epilogue in recent times. The story starts with an ocean, the Iapetus Ocean. The land which lies beneath Flodden was, some 500 million years ago in the Cambrian Period, in the middle of this ocean. The sediments laid down and now turned to rock and the creatures that lived in it and now preserved as fossils, can be found within a belt from the Lake District across to the Southern Uplands of Scotland including the Berwickshire coast. The way the Iapetus Ocean closed resulted in the complex set of igneous and metamorphic rocks which now form much of the highlands of Scotland. It also caused the intense folding and faulting of sedimentary rocks from the Iapetus Ocean, which are now exposed on the Berwickshire coast and give graphic testament to the elemental forces at work as these continents collided. It also created the first physical union of what is now England and Scotland. The deep crustal division between these conjoined continents is referred to as the Iapetus Suture. The Iapetus Suture is crucial to the story of Flodden because this broad, complex and relatively weak zone is exploited by later earth movements and reflected in the orientation of the landscape today. The Cheviot volcano is hugely important in the story of Flodden Field and not only because lavas from the volcano underlie both Flodden Ridge and Branxton Hill. Throughout its geological history, the large mass of hard igneous rock tended to remain as an upstanding edifice which amongst other things precluded any sane movement of either the Scottish or English armies to the west. The Cheviot volcano erupted in the very last phase of the Caledonian Orogeny and what we see today represents the deeply eroded remains of a stratovolcano: a volcano built of layers of hardened lava and volcanic ash. Most of the plateau around the Cheviot is formed of these volcanic rocks with lava flows in the majority. The step like features seen on the westward extension of Flodden Ridge may represent individual flows and give some idea of the scale of magma flows. This lava pile now eroded to a thickness of some 600m is estimated to have an original thickness of some 2km. After the lava pile had formed, a final major episode saw magma rising high into the core of the volcano to form a large and slowly cooling set of nested magma chambers. This is now preserved as a yolk-like outcrop, within the very large fried egg shaped outcrop of the volcanic lavas, and forms the highest ground of the National Park including the Cheviot and Hedgehope Hill. After the Caledonian Orogeny the crust relaxed and stretched using reactivated Iapetus Suture faults which allowed sediments to pile up in the progressively deepening Tweed Basin formed between the Cheviot and the Southern Uplands. At the time the Carboniferous sediments were being laid down there was another ocean, the Rheic Ocean, which separated England from Cornwall and the rest of northern Europe. 50 million years later at the end of the Carboniferous this ocean closed causing the Variscan Orogeny and creating amongst other things the Cornish granites. The slow, inexorable and massive force of this collision was transmitted as far north as Flodden Field, re-activating weaknesses created along the Iapetus Suture which had been active throughout the formation of the Tweed Basin. The Flodden Fault, which trends broadly east-west across the centre of the battlefield, is one of these lines of weakness and is the most significant division between the forces arrayed on Branxton Ridge: the English formed up on the north side and the Scots to the south of this fault. Many tens of metres of movement along this fault plane has juxtaposed the softer Carboniferous sedimentary rocks forming low ground in the north, against the Devonian andesites of the Cheviot volcano which form high ground in the south. The red layers on the left (south) beneath Branxton Hill represent Devonian andesite lava flows and the brown layers on the right (north) beneath Pipers Hill represents Carboniferous sedimentary rocks. Separating them is the steeply inclined Flodden Fault. Smeared over the top of all the solid rocks is a layer of blue icing representing boulder clay. Finally around Pipers Hill there are mounds of yellow icing representing sand and gravel. The last 2.4 million years has been an ice-age within which there have been repeated periods of glaciation separated by warmer interglacial periods. During the glaciations, sheets of ice nearly a kilometre thick covered this area. We now live in an interglacial period with the last of the ice-sheets retreating from Flodden some 14 thousand years ago. Much of the present day landscape of Flodden has been carved by these glaciations acting on existing beds of rock and exploiting the differential hardness of the rock types. Ice moves slowly, but with the weight of a kilometre of ice and entrained rock debris it is a very effective landscape sculpting tool. The ice-sheets, as well as eroding the underlying bedrock, can also deposit new sediments, leaving distinctive deposits at the margins of the sheets as well as extensive drapes of a melange of clay and many sized boulders (surprisingly known as boulder clay!) laid down under active ice-sheets. These sediments are collectively referred to as glacial till. When the ice-sheets melted, vast amounts of sediment-rich water was created which eroded deeply incised valleys inside and outside the melting ice-sheets as well as dumping much sand and gravel as outwash in braided stream channels. The glacier itself sometimes operated as a dam to the meltwater creating large glacial lakes in which calmer waters allowed layers of sand and clay to form. At the peak of glaciation ice would have flowed from the west wrapping around the north and south of the Cheviot, meeting with southward flowing ice-sheets from the Scottish Highlands to the east. Ice also gathered on the Cheviot which flowed radially to join this passing ice. This meant that ice would have flowed from west to east along the length of the ridges at Branxton and Flodden and then turned towards the south into the Milfield plain. While the ice was active, glacial till would have been lodged over the whole area though more thickly in the valleys of the Pallinsburn and between Branxton and Flodden Ridge. Returning to Flodden Field, the low, undulating ground on which the English army formed up for the battle is made up of sand and gravel left by sediment-rich meltwaters released by the retreat of glaciers; this remained relatively dry ground for the English army to wait in a solid defence. churned up and slippery making it hard to maintain their formation.